Finding cat litter on carpeting, clothing, furniture, even your bed... is, well, disgusting. That's why every cat owner searches for the perfect litter mat that will attract litter off their cat's feet like a magnet, the second he leaves his litter box. Is there a perfect litter mat? One thing you should be aware of when purchasing a cat litter mat or any pet product is the BPA and phthalate (pronounced 'thalate') content. Phthalate is often present in polypropylene and other plastics and is considered, like BPA, harmful to you, your pets, and the environment. Stay away from it! The litter mats below do not contain BPA or phthalate. Easyology has two sizes of large: Easyology Extra Large Super Size (35" by 23") and Easyology Jumbo Size Cat Litter Mat (47" by 35"). The Easiology mats have more than 6,000 positive reviews on Amazon, making it one of the most popular kitty litter mats and one of the highest rated. It's made of a heavy, durable PVC - easy to shake out, vacuum, or rinse off. Look at the close-up photo below and you will see how the litter gets trapped in the mat. The Easyology makes a pretty decent doormat or a below-sink mat too! I personally find the Easyology mats to be well made and large enough to work well at keeping kitty litter mess under control. I love the larger size of the Super Size Easiology Mat for just one cat box and the fact that the Jumbo Mat serves two cat litter boxes amply is love in overdose! Also, it's not a bad-looking mat to have around the house. The Easiology comes in grey, as shown in these photos, light grey, black, brown, beige, and blue. The Blackhole is an interesting mat. It has two layers, the top one having both convex and concave 'bubbles' intermittent across the surface. This makes the surface of the mat really soft on kitty paws and, at the same time, makes it easy for kitty to release any litter from his paws into the lower, or catch-all layer. The mat opens at one end, so every day or few days, you can lift the mat, open it, and pour the kitty litter back into the box if you wish. Then you can just hose the mat off with water to clean. The Blackhole Cat Litter Mat comes in black, beige, and a very hot lime green! One neat thing about a double mat is that you can slide a 'puppy pad' between the layers, if you have a cat who tends to pee outside the box. It's a good way to keep the bottom, nylon, layer fresh. Two issues have come up most often with customers: some have said the Blackhole's surface is not 'acceptable' to their cats, and some would prefer two separate layers with a tray as the bottom layer. But these concerns are very infrequent and the ratings for the Blackhole, on the whole, are as high as the others in the top 5 cat litter mats. It comes in black, beige, and lime green! The iPrimio Cat Litter Trapper is a great mat for messy cats, as it has a multi-layered bottom piece that prevents possible leaks. It is similar in design to the Blackhole Kitty Litter Mat (above) but iPrimio has holes that are a bit larger in the top layer for easier removal of larger cat litter. iPrimio also opens on three sides, whereas the Blackhole mat opens on one side. You can use a pee pad between these two layers, but the manufacturer says its 'exclusive plastic film' will prevent damage to the mat, so you don't need an extra pad. This design has caught on and you will find it in less expensive mats, but the quality may not be there. iPrimio comes in small, large, and jumbo! The Smiling Paws Litter Mat will make you smile. It's very functional, don't get me wrong, but the Smiling Paws cat logo does win any logo competition these mats may have! But getting to the functional side of this mat, it's larger than most (actually two large sizes! 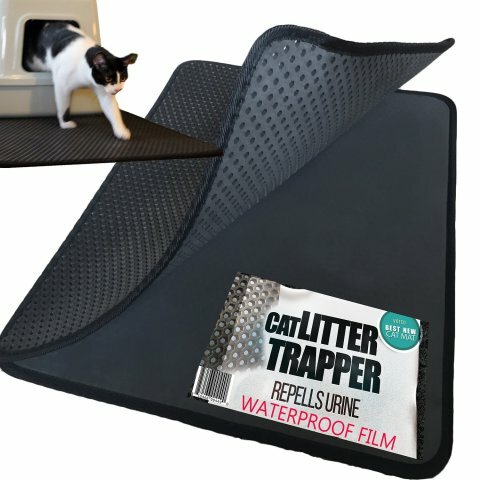 ), customers say it really works at trapping litter, it has a non-slip backing (I wish I could say that about my kitty litter box! ), and it's 'urine-proof.' Well, if that's not enough, the Smiling Paws Premium Cat Litter Mat has a lifetime guarantee! Smiling Paws comes in beige, black, brown, and grey. A spongy, patterned mat, much like the Easyology, above, but Pawkin has a patent on its 'Litter Lock' technology. Pawkin claims its mat is softer than others and that it is easier to clean. The mat can be easily rinsed off with water, but with various sizes of kitty litter used by its customers, it may be tougher to remove some litter than others. If litter should get stuck in the fibers, you might try using a hard spray with a water hose. One customer wrote that she stomped on the mat to break up the litter and then vacuumed it all up. Overall, though, the Pawkin has extremely positive reviews. At 35" by 23," it is the same size as the Easeology extra large size, above. It comes in grey, brown, and beige. Jumbl Paw Shaped Cat Litter Mat Bright and cheerful paw-shaped mat, cleans up nice, and is soft on cat paws! PetMate Litter Catcher Mat Extra large is really extra large, but large and extra large have good trapping capability too! When it comes to choosing litter mats, you have to take the size of your cat's litter box into consideration, as well as the material of the mat. More than one mat may be necessary to cover the areas where your cat tends to shed litter. Also, some cat litter boxes have more than one exit, so all exits need to be protected. Please remember to save and share this article. This article is one of our Always Fresh Articles - updated often to make sure they have the latest info you need. If you need a great vacuum for picking up any stray cat litter, take a look at what we recommend as the best vacuums for picking up cat litter below.